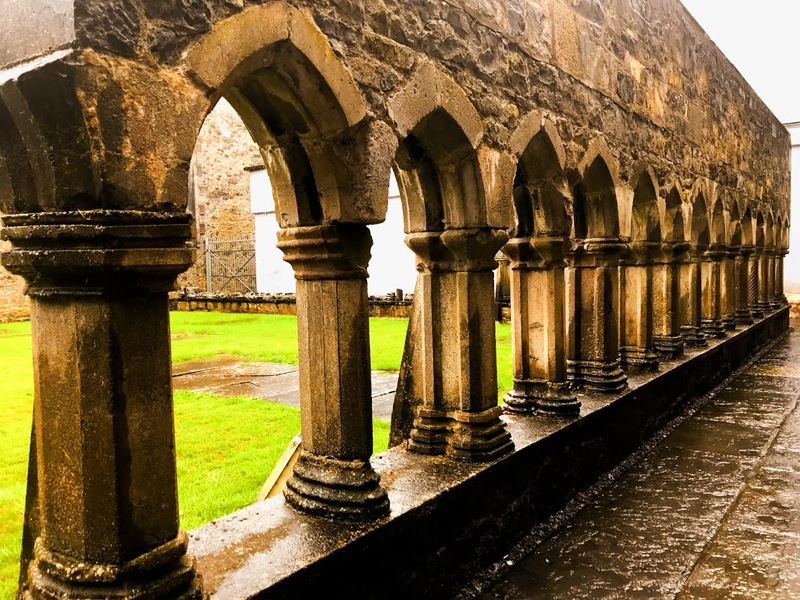 Since the 13th century, the Franciscan Friary has been the focal point in Ennis, the country town of Clare. Over the years, this has been a Franciscan house, a royal seat of the Kings of Thomond, a courthouse, a jail, and a Church of Ireland parish church. The friary was probably established around 1240-1250 under O’Brien patronage in their mediaeval settlement. 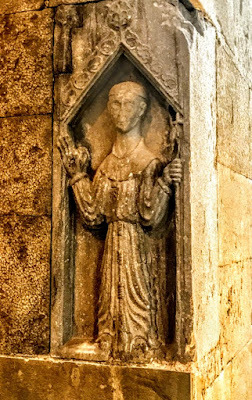 Today the Friary is in the care of the Office of Public Works, and much of the friary building survives intact, including its very fine stone carvings, now exhibited in the recently refurbished nave of the church. The Franciscans arrived in Ireland in the early 13th century. Franciscan tradition says they first arrived in Youghal, Co Cork, in 1224, and expanded from there throughout Ireland. But the actual date may be later as the Franciscans first arrived in England in 1224. The Irish Province was established in 1230 at a meeting of the General Chapter in Assisi. Richard of Ingworth, who had been a pioneer of the Franciscan mission to England in 1224, was appointed the first Provincial Minister in Ireland. The Franciscan friary in Ennis was built on an island in the River Fergus at a point where the river divides. The island is now incorporated into the streetscape of the town, but traces of the O’Brien mediaeval residence and late mediaeval houses are scattered throughout the town. Ennis Friary was one of a series of Franciscan friaries that benefitted from O’Brien patronage between the 13th and 15th centuries. The original O’Brien founder of the friary is unknown: it may have been Donnchadh Ó Briain, King of Thomond, but no records survive. Donnchadh Ó Briain became King of Thomond after a bloody feud with his brother, Muircheartach Finn Ó Briain. It is said that in order to do penance, he decided to build a friary on an island in the River Fergus. Donnchadh submitted to King John and built a new royal residence at Clonroad or Ennis in 1210-1216. He rebuilt the Cistercian abbey at Inislounaght, Co Tipperary, built a Dominican house in Limerick, and is said to have offered shelter to the Franciscans in Ennis around 1241-1242. But when Donnchadh died in 1244, he was buried at the Dominican house at Limerick, suggesting that the friary at Ennis had not been built or completed by then. King Edward I granted the Kingdom of Thomond to his grandson, Thomas de Clare, in 1276. However, Toirdealbhach Ó Briain (Turlough O’Brian) refused to relinquish control of his land. When Brian Ruadh Ó Briain of Bunratty was assassinated in 1277, Turlough became King of Thomond, and fought a war against de Clare, finally defeating him in 1287. The earliest parts of Ennis Friary date from about 1285 or later, and the friary appears to have been endowed, rebuilt, extended and decorated in the late 13th century by a later King of Thomond, Toirdhealbhach Ó Briain. The 14th-century heroic tale Caithréim Thoirdhealbhaigh, ‘The Triumphs of Toirdhealbhach,’ tells how Toirdhealbhach Ó Briain, King of Thomond, supplied the friary with sweet bells, holy crucifixes, a good library, embroidery, glass windows of blue glass, veils and cowls, before he died in 1306. Turlough’s sons, Muircheartach Ó Briain (King of Thomond, 1311-1343) and Donnchadh mac Toirdhealbhach Ó Briain (Prince, 1306-1311) were both buried at the friary. The blind MacCon Caech MacNamara rebuilt the sacristy and added a refectory or dining room to the friary in 1314. When he died of the plague in 1347, he was buried at the friary. It continued to prosper and in 1350 a Papal Indulgence was granted to Ennis for the feasts of Saint Francis and Saint Anthony. Under the patronage of the O’Brien family, the friary flourished as a school for novices (stadium) and also attracted accomplished sculptors. Richard of Windsor granted the friars permission in 1375 to travel beyond Thomond in search of funds. That year, the chronicles also mention a school at Ennis for the first time, and two friars from Ennis were sent to study in the Franciscan stadium in Strasbourg. The cloister and transept were added in 1400. An Irish lector in theology, Thaddeus MacGillacunduin, was appointed in 1441. 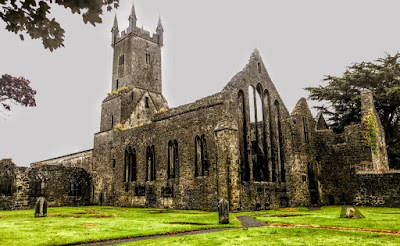 Ennis Friary is said to have accepted the Observant reform in 1460. The late 15th century was a particularly active period of building, a bell tower was added in 1475, and the large south transept – the Lady Chapel or Michael Chapel – added to the church in the mid-15th century, was enlarged around 1500. A beautifully executed series of carvings was added to the church in the 15th century as part of a devotional cycle that introduced the laity to the Passion and Resurrection of Christ. Saint Francis, displaying his stigmata or the marks of the wounds of Christ on the cross, was placed to the left of the great rood screen while to the right was a carving of Ecce Homo, Christ as the Man of Sorrows surrounded by the Instruments of the Passions. A broken statue of a Pietà shows the sorrowful Virgin Mary with her dead son lying across her lap. The MacMahon-Creagh tomb, said to have been commissioned by Máire O’Brien MacMahon around 1470, narrates the scenes of the Passion: the Arrest of Christ, his Flagellation, his Crucifixion, his Entombment and the Resurrection. A woman in a panel beside the Resurrection holds a book and is dressed in contemporary clothing, including an impressive headdress. This may be a depiction of the donor, Máire O’Brien holding a Book of Hours. 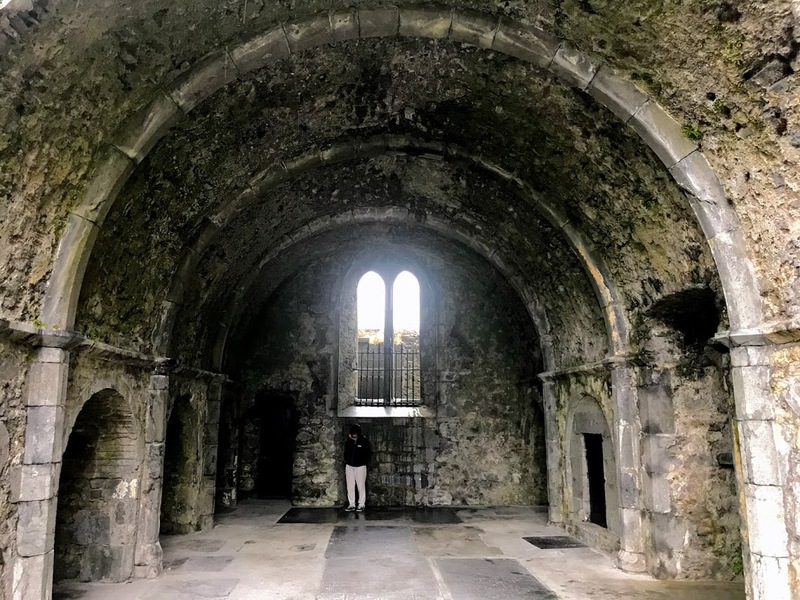 In 1491, the friars of Ennis friars lost their case against the friars of Askeaton, Co Limerick, in a dispute over the limits of each friary’s area for seeking alms. Conor na Srón (‘The Nose’) O’Brien, who died in 1496, and his daughters were particularly associated with the Franciscans. 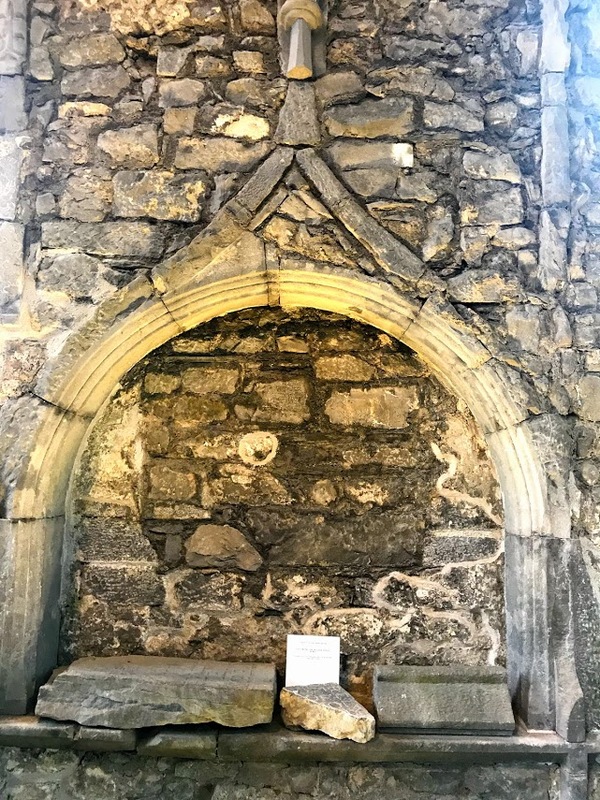 Conor led a violent life and was said to have fathered two sons with his daughter Renalda, abbess of the nearby Augustinian convent of Killone and who herself was buried in Ennis friary when she died in 1510. On his deathbed, Conor feared his final judgment, but Fergal O’Trean, a saintly Franciscan preacher in Ennis, agreed to take on the burden of the chieftain’s sins. When Conor died he was buried in the friary and, according to a 17th century legend, his soul was seen entering heaven borne there by the friar’s prayers. Meanwhile, the order’s Provincial Chapter met in Ennis in 1507, and the Observant reform was accepted once again in the friary in 1540, indicating it may have been adopted half-heartedly in the past. Despite the Dissolution of the monastic foundations at the Reformation, the Franciscans continued to be present in Ennis. Murrough O’Brien surrendered to the Lord Deputy, Anthony St Leger, in 1543. Renouncing the title of king, he became the first Earl of Thomond, and received the properties of Corcomroe Abbey and Clare Abbey, while his nephew, Donough O’Brien, received Quin Abbey. Murrough O’Brien died in 1543 and that was also the last year the Provincial Chapter met at Ennis. Despite the official suppression, however, the Franciscans held on. Although the O’Briens probably took possession of some of the friars’ lands they also continued to support them. 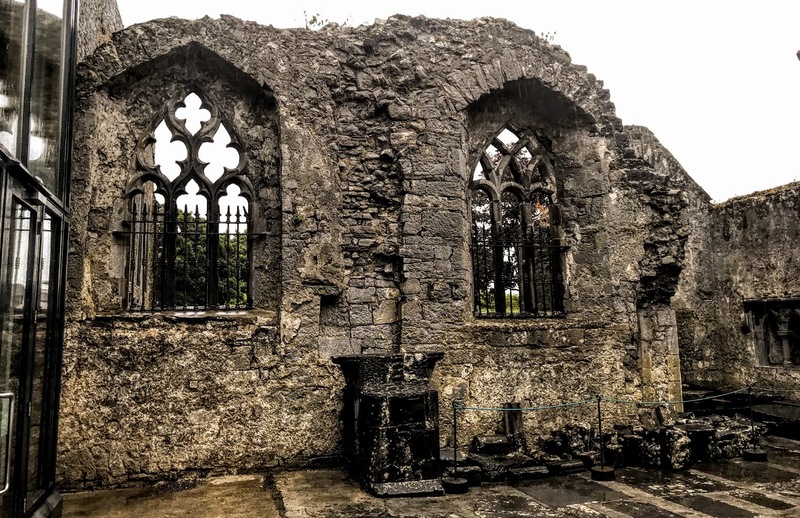 During the Desmond Rebellions, Edward Fitton held the assizes in Ennis Friary in 1570, having been forbidden to do so a year earlier by Connor O’Brien. The friars were still in Ennis in 1570, claiming to have restored the faith to Cornelius O’Brien to Catholicism that year. In 1577, the friary was granted to Conor O’Brien, 3rd Earl of Thomond, who died in 1581 and was buried in the friary. The friary was leased in 1577 to Dr Daniel Neyland, Rector of Inniscattery in the Diocese of Killaloe, and later Bishop of Kildare, and in 1587 it was leased to James O’Neyland, when provision was made for courts, a jail and apartments for visiting Tudor officials. Donogh O’Brien, 4th Earl of Thomond, was raised in the court of Elizabeth I. He returned to Clare as an Anglican, sat in the Irish Parliament, and in 1588 became a member of the Council of Connaught. In the early 17th century, Donogh O’Brien asked the Church of Ireland to take over Ennis Friary as a place of worship. But the friary was in very good condition, thanks primarily to the care of O’Brien, who maintained the buildings, using part of the friary as a court and lodgings but not altering the fabric of the buildings. He also held the gold and silver plate of to the Friary, although the Franciscan chronicler Donatus Mooney suggested that this was to ensure their safety on behalf of the friary. Individual friars remained at the friary, including ‘The Mad Friar’ Dermot O’Broduin, a member of the Broudin family who served as the biographers of the O'Briens and who had returned from Spain. He was captured but declared insane by Donogh O’Brien, who pleaded that only a madman would travel about in a friar’s habit, preaching openly, as he was. This allowed the ‘insane’ friar to continue living at the friary, wearing his habit and saying Mass in his room until he died in 1617. The buildings were converted for use as a Church of Ireland parish church in 1621. Donough O’Brien died in 1624. The friars soon returned to Ennis, the friary was re-established in 1628, and Thaddeus Gorman became the First Guardian of the friary in 1638. During that time, Mícheál Ó Cléirigh visited the friary in 1643. During the Cromwellian era, the Friary was suppressed again in 1651. The friars seem to have found refuge at Doolough Lake and Inagh, and the Guardian, Eugene O’Cahan, was executed in 1652. The building and land later became the property of John Gore, a former Cromwellian officer. 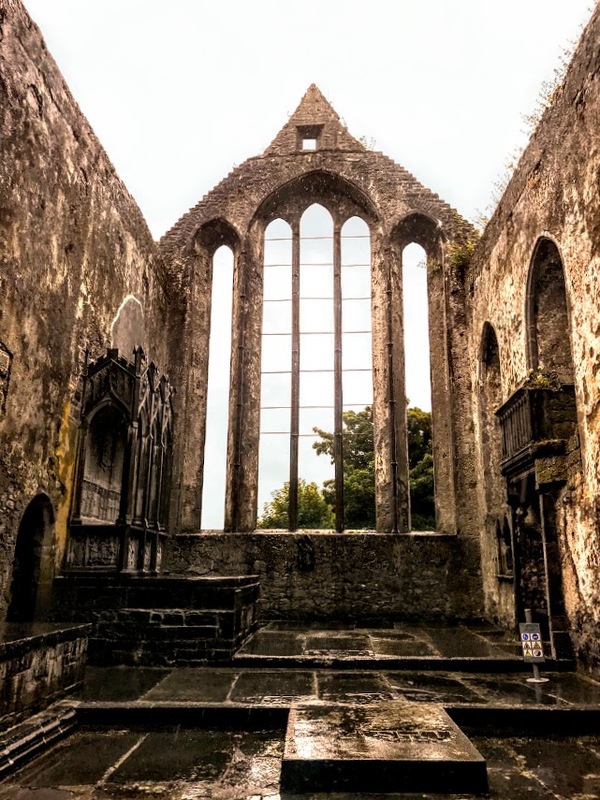 After the Penal Laws were introduced, Laurence Considine led the friars into exile in 1697, bringing the presence of the friars to an end at Ennis Friary. The friary church continued to be used as the Church of Ireland parish church for the parish of Doora and Drumcliffe until 1871. By the early 1800s, the nave had been re-roofed and a window inserted in the new east end within the arch of the tower, with an altar beneath. The walls were plastered, covering numerous old memorials. Lightning strikes supplied the impetus for restoring the tower with the addition of its distinctive spike pinnacles and parapet. But the upkeep of the old building had become too expensive for the parish, and a new parish church was built on Bindon Street. Once the church and the friary had been abandoned, they quickly fell into decay. The nave was covered by a roof until 1887, but by 1893 all the interior was fully exposed to rain and wind. The Commissioners of Public Works took control of the site in 1892, and the cemetery was closed to public use in 1893. Despite some repair, the friary remained closed until 1952, when the Office of Public Works did some major work. 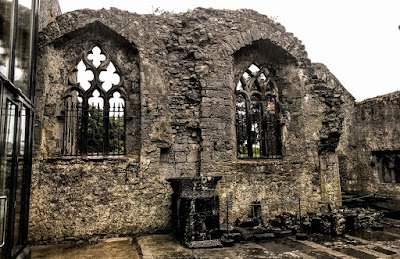 Ennis Friary remained the property of the Church of Ireland until 1969, when, in an ecumenical gesture of goodwill, it was formally gifted by the Church of Ireland to the Franciscans. Ennis Friary is now the property of the state. The church, tower and transept chapel are complete, as are the east range and parts of the cloisters. They are open to the public on a daily basis, and I found the place a fascinating part of my visit to Ennis three days ago [1 August 2018].